A while ago I found some leather offcuts at a recycling depot. I purchased some but it wasn’t until I got back home that I noticed one thick piece of hide had the words “Crazy Horse” written in thick black marker pen on the back. One thought led to another until I searched for information about Crazy Horse, the Native American Chief, online. I found this prophecy he made four days before he was killed. Down in south west Victoria, Australia there is a rocky point known since white settlement as Point Ritchie. To the local aboriginal tribe, the Gundjitmara, the place has always been called Moyjil. Which ever estimation proves to be correct there is something about Moyjil that gets to me. Clambering around on the rocks there I have often had the sense that I am walking with ancient spirits. A friend and I went looking evidence of aboriginal settlement ourselves one morning in late summer a couple of years ago. At the base of the cliffs we found circles of fire blackened stones surrounded by reddened rings. The markings were so subtle it was hard to take photographs of them so I will post a video that is absolutely fascinating viewing. Others are just plain mediocre. watching makes you part of it. There is a river flowing now very fast. It is so great and swift that there are those who will be afraid. They will try to hold on to the shore. They will feel they are being torn apart and will suffer greatly. Know the river has its destination. The elders say we must let go of the shore, push off into the middle of the river, keep our eyes open, and our heads above the water. The time of the lone wolf is over. Gather yourselves! Banish the word ’struggle’ from your attitude and your vocabulary. All that we do now must be done in a sacred manner and in celebration. Yesterday my head was full of troubles – and ideas – and opinions – mine/other people’s – all bubbled like a stew in my mind – achieving nothing – getting kind of toxic or at the least – getting in the way – stopping me being. Just over 5 minutes drive from my house there is a scrap of remnant bushland – the real stuff – never logged – never farmed. It’s the kind of bush that is hard to relate to. No great stands of majestic trees, no tumbling waterfalls or great vistas – instead dry, tangled scrub and spiky native grasses. I have been told there are grass trees quite some way from the carpark so I set off down the dusty track to find them. It was a hot day and even though I was in the bush, 21st century noise still intruded. I could hear the distant rumble of cars on the highway, a farmer was using heavy machinery in a nearby paddock and jets roared overhead from time to time. The track wound on and on. The heat was only just tolerable and I thought of turning back more than once. Still those grass trees were calling me. Eventually they began to appear. Most were some distance off the track and being mindful of both snakes and of disturbing the delicate native plants I didn’t venture closer. Grass trees only grow a few centimetres a year. The largest of the ones I saw yesterday had to be hundreds of years old. In other parts of Australia grass trees lose the foliage around their trunk. Tufts of grass grow atop twisting black trunks. The variety down here doesn’t. Instead thick clumps of foliage hang down in dark, dense curtains. The plants look more like presences than vegetation. Some are almost monstrous, others are delicate and whimsical. This bush reserve is managed by a dedicated team of nature lovers. Wooden benches are placed at intervals through the bush. Just past the grass trees I sat on one to get my energy up before turning back. Sitting there in the afternoon heat I finally stopped – moving, thinking, feeling scattered – I just was. From time to time a jet passed by – high and detached. I could still hear the farmer banging about in the distance. The traffic was a subliminal murmur occasionally punctuated by the roar of a motorbike or a heavy trunk. The 21st century is never far away from me these days. Slowly though, the sounds of the bush asserted themselves. Birds chirped, leaves whispered together, little critters rustled through the undergrowth. I watched a bird hopping from branch to branch. I photographed the abstract patternings of the tangled undergrowth. Mostly I just sat gathering up the energy to walk back to my car. My mind slowed down. No great insights about current events, political ideologies, the massacre in Christchurch, climate change or family dramas came forth. Instead I simply quietened down. I grew more peaceful and more attuned to the moment now. I came back into myself. The Australian Aboriginals have a concept called Dadirri – Deep Listening. They say the answers we all seek are there if we listen deep enough. If we stop and listen deeply to what another is saying we can begin to understand them. If we listen to the bush we can learn how to live in harmony with the Earth. If we listen to our own hearts we can learn how to live peacefully with ourselves. It was a long walk back to my car. The grass trees looked different as I approached them from another angle. I found one close to path that I had overlooked before. I took some photos and resolved to come again with a better camera. It will take me a while to learn to photograph this place. It will take me a while to fully learn the art of deep listening – the rest of my life probably. Once the initial sting from the incident with the Aboriginal man in Visitor Centre subsided the woman could see that the situation had its funny side. An question about glue making had led to her coming unstuck on all kinds of levels. Beyond that wry humour though were some difficult realizations. Googling cultural appropriation had bought up a lot of interesting articles written from an indigenous perspective. Reading them she could understand their anger. Of course Native Americans would be disturbed by the sight of fashion models wearing traditional War Bonnets on the catwalk. Of course Asians had the right to be offended when a pop star painted her face yellow and pretended she knew what it was like to be Asian in a predominately white country. Of course Aboriginal people were grieving over the loss of their country and the way their culture was constantly appropriated by others. Online she searched for a definition of cultural appropriation. Opinions varied as to what it actually was but through careful reading she came up with her own understanding – cultural appropriation occurred when the ideas, beliefs and/or artifacts of a minority group were taken out of context and used for the material gain of others. In other words it was a kind of theft. One thing that bothered many indigenous people was the way their ideas and sacred objects were taught in New Age workshops by people who had no cultural connection to those ideas and objects. Reading that the woman found herself in a very grey area – a place where some of the values and objects she cherished began to come unstuck. Did that mean she should dispense with them and cherish only values and objects that came from her own ancestral cultural heritage? Alone in the light of the full moon she walked around the Medicine Wheel she had created in her garden. Was it wrong of to her to that? Sure she’d originally learnt the about the Four Directions from other white women in New Age workshops. Since creating the Wheel though she had spent time exploring the deeper significance of the ideas surrounding it. Then there was the time-out-of-time she spent sitting and standing in the Wheel holding her own private rituals where she acknowledged her connection to the Earth and the Cosmos. The experiential insights she had gained then about the sacred nature of all life could not be forgotten. They had become the cornerstone of her being. The Medicine Wheel was just one example. 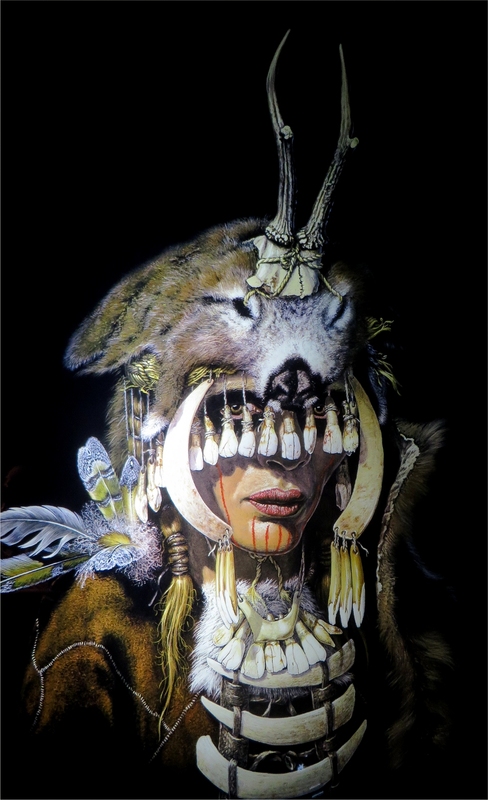 There were the objects she made intuitively with natural materials – feathers, sticks, leather, string and gemstones. The private things she made in ceremony and rarely showed to others. Her own version of sacred objects. Sometimes after the making she would discover in an old book or during some random online surfing that the objects she made were similar to sacred objects used by indigenous people, particularly the Lakota Indians. Attempting to understand herself she had come to think that maybe the desire to make these objects came to her because of past life connections with the Lakota. Alternatively her Western mind reflected on Jung’s ideas of the Universal Unconscious and Joseph Campbell’s ideas about sacred symbols and objects that endured across time, space and cultures. It was the making of these objects that had led her to ask about making glue in the first place. For years she had thought that it would be better to use natural glues for the making rather than the chemical stuff that gave her headaches. All of that had been too much to try and explain to the angry Aboriginal man though. When he’d demanded to know why she had wanted to make the glue she’d stuttered out some vague response about making dream catchers. No doubt she’d come across as a ditz. The man may have thought she wanted to make them to sell. And to be honest there were times when she’d considered making more accessible objects like Dream Catchers and selling them at markets. The desire to do anything like had utterly deserted her now though. Looking around at the objects she had created or purchased from others she could easily see the ones that had some kind of spiritual and sacred resonance and those which were merely decorative objects. Those she had bought from others she bundled up and gave away a charity shop. The ones she had made herself she dismantled systematically. As she worked she explored her ideas and intuitions surrounding them. It came to her that were two ways of making these things – two ways of being really. One was grounded in the material world and often the reason for making the objects was the desire for material gain or simply to make a pretty object to hang on the wall. The other way was intuitive and spiritual – the world where Jung’s Universal Unconscious flowed through time, space and cultures – the Sacred Space of Ceremony and Ritual. In that space Bunjil the Aboriginal Creator Being flew in his eagle form flew alongside the Sky Dakini of the Tibetan Buddhists and the Angels of the Christianity. In that space the sticks and stones she glued together to make wands and prayer sticks had the same significance as similar objects made in a sacred way by indigenous people. In that space the Black Madonna of her own cultural traditions walked alongside the Lakota White Buffalo Woman and the countless other manifestations of the Earth Goddess. In that space the feeling of connection to life that she found in the Australian bush or on a mountain top in Ireland or in the silence of meditation was not something she appropriated from anyone. It was free for all to connect to. Maybe in fact it was that energy would eventually connect all who had eyes to see it, ears to hear it and a heart to feel it. The urge to mark the Earth and ground the spiritual into the physical seems to be as old as humanity. I once saw a program on TV which tracked the journeys of the earliest people out of Africa. Their routes could be discovered by the traces they have left behind – paintings on rocks, carvings and curious configurations of rocks upon the ground. Rock art near the Grampians in Western Victoria, Australia depicting the creator being Bunjil with two red dingo. Sometimes the significance of symbols and constructions of earlier peoples has been lost in the mists of times. Other times it has been obscured by those who came afterwards. Remains of a Celtic Christian construction in Western Ireland that has been tidied up and reconstructed by over-zealous 20th century archaeologists. Medicine Wheels, some of which date back thousands of years, have been discovered across the Americas. There is also evidence that the aboriginal people of Australia also constructed similar Wheels at some distant time the past. The Celtic Cross can also been seen as having a similar significance for, in it’s original form it predates Christianity. While a lot information about the original purpose of these stone constructions has been lost there is something about them that still resonates today. About a year ago I got an overpowering urge to make a Medicine Wheel in my backyard. I knew very little about them but felt compelled to learn more and construct some kind of 21st century version. I went to a short Workshop which introduced me to the basic principles. The Native American Medicine Wheel can be seen both a physical embodiment of spiritual energy and as a method of charting inner psychological realities. The Four Directions on the Wheel have correspondences to physical conditions and to aspects of the human experience. For example, the direction of East can be seen as the place of the physical dawn and also as the direction which signifies illumination and mental clarity. Since I made the Wheel in my garden my understanding of it has grown a great deal. Some of my understanding comes through reading online articles about contemporary Native American interpretations of the Wheel. One thing that really confused me at first was how to apply the Wheel to the southern hemisphere. It was only when I realised that the polarities of north and south reverse in the southern hemisphere (e.g water goes down a plug hole in a different direction north and south of the equator) that I was able to figure out how the Wheel could have personal significance for me. In the northern hemisphere the direction of north is the place of winter but here in the south the sun swings to the north during our summer months. For us the north is the place of heat and the mid-day sun. Once I understood that I could adjust my understanding accordingly. A lot of my understanding of the Wheel is experiential and comes from the time I spend sitting in contemplation. Sometimes my meditations are deep and trance like, other times they are consist of a short ritualistic walk around the Wheel acknowledging its significance. Other times I simply place a garden chair in or near the wheel and sit in a reflective state for a period of time. While reflections on the attributes of the Four Directions are intriguing it is the centre of the Wheel that holds the most fascination for me. For me, this central point is a symbolic marking of the Axis Mundi – the vertical axis where the energies of the spiritual realms of the heaven flow into deep in the Earth and connect with the fecund, creative energies of the natural world. It is a metaphysical point but it is also a physical one where the energies of the sun and the greater cosmos impregnate the fertile soils of the Earth. The energies of both realms then unite to produce the abundance and diversity of our physical world. I find it hard to put these concepts into words but as my intuitive understanding grows I feel myself to inwardly enriched by making a daily connection to the sacred through the Medicine Wheel I have constructed in the physical world of my backyard.